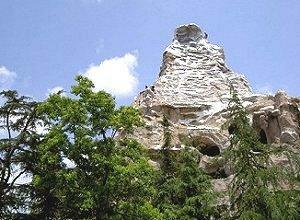 The Matterhorn is a classic Disney coaster. While many people visit theme parks for the whole experience of shows, games, and rides, Disneyland roller coasters are some of the most popular attractions at this Southern California wonderland. With coasters suitable for all ages, there is a thrilling ride every guest can enjoy. There are four fun roller coasters to choose from at the Disneyland theme park, each of which offers a unique experience and fun excitement for the whole family. The Big Thunder Mountain Railroad has been popular opened in 1979, but it's not the only option in the park. Matterhorn Bobsleds: The Matterhorn is an iconic sight at Disneyland and the mountain's instantly recognizable peak has been a part of the park since opening day in 1959, when this twin coaster first began thrilling riders with its journey into the Alps. Racing toboggans careen around Matterhorn peak through caves, across bridges, and past an icy waterfall. The fearsome Abominable snowman threatens riders deep in an ice cave, and the ride's thrilling finish includes a drop into alpine ponds for natural water braking. From the chalet-style loading zone through the snowy mountain and to the chilly splashdown, Matterhorn Bobsleds is a classic and entertaining ride. Space Mountain: This futuristic ride - appropriately located in Tomorrowland - is one of the most thrilling Disneyland roller coasters. The original ride operated from 1977 to 2003, when it was shut down for two years and completely renovated. 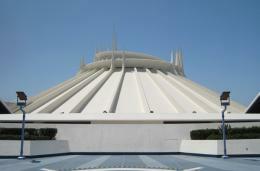 The new Space Mountain debuted to rave reviews in 2005 and continues to thrill more riders each year. Completely enclosed in a stylish dome, Space Mountain contains shooting stars, satellites, and an updated futuristic soundtrack for a completely immersive experience that far exceeds the former ride's strobe lights and star machines. From the first step into the Space Port to returning to Earth after a fantastic ride, Space Mountain never fails to delight riders. Gadget's Go Coaster: This kiddie coaster opened in 1993 and immediately became one of the most popular children's rides in the park. Themed after Gadget from the Rescue Rangers movie, this coaster winds through a colorful and crazy setting that includes a salvaged soup can, massive comb, and used thread spool in gigantic proportions. The curvy coaster reaches a top speed of 22 miles per hour and offers mild thrills for young riders without the severe big drops that could be too intense for novice coaster fanatics. In addition to the four roller coasters located in the original Disneyland park, two additional coasters can be found in Disney's California Adventure, the sister park just steps away from Disneyland. California Screamin': This scream machine is a steel coaster with a LIM launch system and is designed to look like a classic wooden coaster. The single loop encircles the iconic mouse ears that are an international symbol of Disney magic, and with a top speed of 55 miles per hour, this coaster takes that magic into the fast lane. Mulholland Madness: This wild mouse style coaster mimics a crazy freeway ride in a colorful and family-friendly way. With fewer steep drops than a traditional wild mouse roller coaster design, Mulholland Madness is perfect for younger riders. Both Disneyland Resort theme parks can become crowded throughout the year, and knowing how to best ride the roller coasters can help guests maximize their Disney fun on any visit. Heed Warnings: Most of the Disneyland coasters include sudden turns and dips that can aggravate different health conditions. Guests with heart, back, or neck trouble, guests who may be pregnant, and guests who are subject to motion sickness may want to reconsider riding these coasters. Space Mountain, because it includes strobe and other lighting effects, can also be hazardous for individuals with epilepsy or other nervous system conditions. Choose the Best Time to Ride: Coaster lines are shortest very early in the morning just as the park opens, as well as later in the day when major shows are being presented. If possible, avoid the larger coasters during midafternoon when the waits will be longest. Use FASTPASS: Both Big Thunder Mountain Railroad and Space Mountain are equipped with Disneyland's FASTPASS rider reservation system, allowing riders to schedule their time to ride and avoid waiting in the longest lines. Take Pictures: With their exquisite landscaping and Disney quality details, all the Disneyland coasters are highly photogenic. Be sure to take plenty of pictures of the rides to use as great mementos of your visit to Disneyland. The four Disneyland roller coasters, and the two located at Disney's California Adventure, are thrilling attractions suitable for all ages. By experiencing these classic Disney rides, you can maximize the excitement of your Disneyland theme park getaway.